Investors have been increasing their stakes in small cap equities since mid-May, according to EPFR Global, a Boston-based firm that tracks the performance of $38 trillion in mutual funds and ETFs. 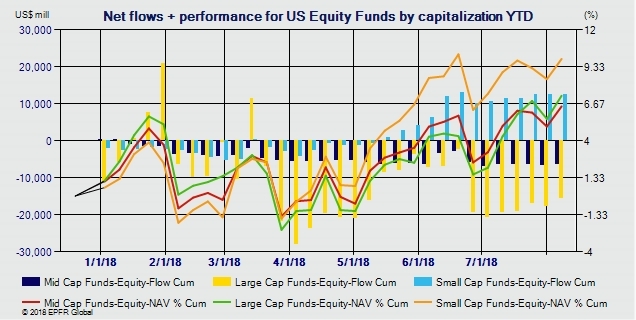 During June, net inflows into small cap funds rose to around $10 billion a week and have continued at the pace through mid-August. The move into small caps that began in May has given investors in this sector a significant bonus. 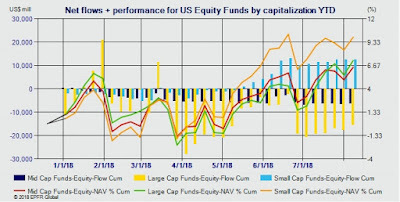 "This year small caps as a fund group are the best performing through the first week of August,” beating large cap and mid cap, according to Cameron Brandt, director of research for EPFR Global. The performance premium for small caps began in March and then took off in May and has continued into August. Optimism in the small business sector of the U.S. economy has been rising since late 2016. The Small Business Optimism Index rose to 107.9 in July. It was the second-highest reading in the survey’s 45-year history, just shy of the all-time high of 108 in July 1983, according to the National Federation of Independent Business, which conducts monthly small business sentiment surveys. Businesses with fewer than 500 employees represent nearly half the economy, according to the Small Business Administration. The net increase in allocations to small cap equity funds is almost entirely from shifts by institutional investors and not retail investors, according to Brandt. 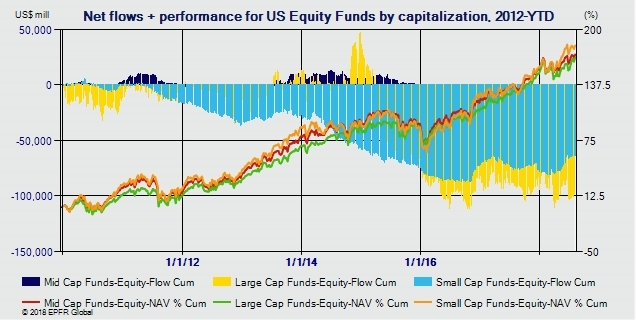 Diving deeper, one finds that net inflows into small cap growth equity is outpacing those into value and blend funds, according to EPFR. The surge of new money from investors marks an enormous turn around in sentiment for the small cap sector, according to Brandt. The data bear this out. From 2012 until the end of the first quarter, there was a significant exodus of money moving out of small cap funds, driven largely by a deteriorating outlook for small businesses during those years, according to Brandt. Net outflows from small cap funds, which began modestly in the second half of 2011, rose to $10 billion weekly in early 2012, then $25 billion in 2014, hitting more than $175 billion weekly in early 2016. 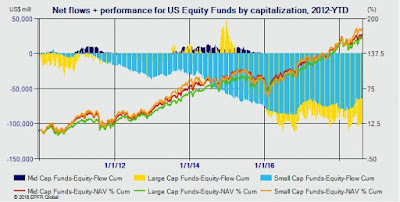 The move into small cap equities stands in contrast to ongoing multi-year outflows from both mid-cap and large cap stocks as institutions have trimmed their equity exposures after huge stock price run-ups. At the same time, baby boomers in the individual retail market have continued to switch from equities to fixed income investments, according to Brandt. Performance for small cap stocks began to rise after the 2016 election and gained momentum in December after Congress passed tax reform legislation lowering business tax rates.